In response to these challenges, a grassroots movement has emerged that seeks to empower urban residents with the tools and information necessary to address residual industrial toxicity in their ecosystems. Focusing on methods that are simple and affordable, this movement wishes to remove the barriers of cost and technical expertise that may be otherwise prohibitive. This paper will give an overview of case studies of organizations that have been successful in implementing these strategies. Soil is a living network. It is teeming with billions of microorganisms engaged in diverse ecological relationships with each other, much like humans in a city. Healthy soil is the foundation of nutritious food production, and arguably therefore of civilization itself. The relative sustainability of societies throughout history can often be attributed to how they treated their soils. Cultures with practices that regenerated the health of their soils persisted, while those cultures that depleted their soils either collapsed or were forced to move elsewhere. Despite the fact that cities have been historically built in regions with high soil fertility to support their populations, the health of soils in today’s cities is rarely considered by residents or planners. Soils rich in organic matter have been cleared in order to expose the firm mineral soils below, deemed more suitable for supporting the foundations of structures. Productive farmland is paved over as urban sprawl extends beyond city limits. As the economy has become increasingly globalized and food is imported to cities from greater distances, urban residents have forgotten their connection and dependency on the well-being of soils. The critical web of relationships between humans, plants, and microorganisms has been largely neglected and forgotten. Plants, when given synthetically derived fertilizers, fail to develop symbiotic partnerships with soil bacteria. When given synthetic nutrients, they are no longer reliant on soil microorganisms and will cease giving off their root exudates to feed them. Without the soil bacteria producing mucus that binds soil particles together, the health of soils deteriorates and becomes subject to erosion. This pattern of soil abuse and neglect is further manifested in the form of urban soils being contaminated with industrial by-products. Cities historically have served as centers of industry: manufacturing, smelting, and refining businesses have been commonly located in urban areas. As a consequence of this, many pollutants produced as by-products of these industries over the past two centuries have concentrated in the air, soils, and waters of urban ecosystems. Exposure to these toxins presents serious health risks to both humans and non-humans living in the city environment. As some of these pollutants may persist for centuries, their impact will extend long into the future. As an issue, urban soil contamination has gained a particular amount of attention recently as interest in urban agriculture and community gardening has increased. Community gardens are defined as being areas of land utilized for food production by (typically) urban-dwellers with limited access to land. There are currently an estimated 18,000 community gardens in the US and Canada alone. Such efforts may have the potential to provide city residents with a significant amount of their nutritional needs, and improve the overall quality of urban life for many. Because gardeners are coming into direct contact with potentially contaminated soils, inhaling their dusts, and growing food in them, they are at a high risk of harmful exposure. Low-income urban populations are at particular risk, as polluting industries are more likely to be situated within low-income neighborhoods. Additionally, negligent landowners are less likely to have carried out lead paint remediation in poorer neighborhoods, which may continue to impact the soils and the health of communities to this day. There is a tremendous amount of uncertainty in regards to the health concerns associated with urban gardening. Complicated interactions between contaminants, soils, plants, and people create difficulties in making general statements regarding the safety of urban gardening. Frameworks for doing proper risk analysis that take all these complexities into account have not been developed to date. Despite these uncertainties, there are many benefits to urban agriculture and community gardening and the practice as a whole should be encouraged. Along with the development of urban agriculture, however, there needs to be a heightened awareness of the potential risks involved, as well as better defined best practices for urban gardeners to use to protect themselves from soil contaminants, and for addressing their long-term remediation. In recognition of this issue, US EPA has drafted a number of documents that suggest best management practices for urban agriculture. These contain suggestions ranging from personal hygiene (washing hands, vegetables, removing shoes after gardening) to stabilization of soils using ground and vegetative covers, depositional barriers, and pH neutralization. These best management practices suggested by governmental agencies are likely effective at protecting gardeners from direct exposure to contaminated soils. They are, however, palliative, making no suggestions as to how to permanently address the toxic substances that persist in soils. Covering contaminated soils with groundcovers, while practical as a short-term solution, are in effect “sweeping the problem under the rug”: numerous toxins will persist in the environment and can once again become a risk if they are disturbed and unearthed. In order to address soil contamination in a meaningfully long lasting way, techniques need to be employed that are capable of degrading contaminants into their harmless components, or permanently sequestering them so that they will pose no risk to future gardeners. In keeping with an ethic that values soils as both precious and vulnerable, such long-term strategies are required. Bioremediation may be one possible method of achieving these goals. In instances where relatively low levels of contamination are present, it may be possible to degrade toxins or to render them immobile using a technique called bioremediation. Bioremediation is the process of using the biological properties of naturally occurring organisms, primarily microorganisms, fungi, and plants, to degrade, immobilize, or sequester environmental toxins. One significant advantage of bioremediation is that it is considerably less expensive than conventional treatments, and can be performed “in-situ” with minimally disruptive techniques. Perhaps the greatest benefit of bioremediation, however, is that it is a sustainable method of soil remediation. By cleaning soils in situ, it makes it possible for future generations to make use of them again. While bioremediation shows great promise, significant barriers still lie in the way of its wide scale implementation by non-specialist community members. Highest ranking among these are the cost of doing soil analysis in laboratories, and an overall low level of scientific literacy among the public. For these reasons, bioremediation has remained a technique used nearly exclusively by professional engineers. In response, a grassroots movement has emerged that desires to empower urban residents with the tools and information necessary to address residual industrial toxicity in their ecosystems. Focusing on methods that are simple and affordable, this movement seeks to remove the barriers of cost and technical expertise that may be otherwise prohibitive. This movement envisions community-based bioremediation as a form of citizen science, where the tools for data collection, soil analysis, and degradation of toxins is put into the hands of community members most affected by toxicity. In this regard, citizen bioremediation acts as a form of generative justice, putting the technical and scientific means of addressing soil toxicity into the hands of historically marginalized populations who have suffered a disproportionate burden of toxic exposure. Generative justice is furthered through citizen bioremediation by constructing mutually symbiotic partnerships between humans and non-humans: by providing microbes, fungi, plants, and worms with ideal environmental conditions and a food source, humans are in return given detoxified and nutritionally enhanced soils. This human/microbe symbiosis works to promote healthier urban ecosystems overall. Critics of the idea might question why one would go to the trouble of developing this bottom-up bioremediation approach when large-scale industrial remediation techniques are already available? The importance of citizen-based approaches is better understood when seen through the lens of human and non-human value circulation. Industrial remediation techniques extract value from communities by the enormous costs, physical disruption, and social disturbances created by them. In contrast, citizen bioremediation is characterized by methods that enhance a community’s ability to generate and circulate value. By becoming familiar with basic bioremediation techniques, urban gardeners can train one another in these methods. Furthermore, the microbial cultures used in the process can be maintained and shared, similarly to how a traditional sourdough starter is passed on between families. In this sense, the value of these microbial cultures and bioremediation know-how can be continually circulated within a community. This generative justice approach is markedly different from the conventional approach of hiring experts to fix problems at great expense and leaving them with no lasting tools for continued empowerment. A community-based approach to bioremediation is in many ways contrary to the goals and assumptions that are fundamental to the discipline of environmental engineering. In engineering, uncertainty is denied, control is emphasized, and variables are reduced. A generative justice approach would necessarily be complex in nature, involving high levels of uncertainty and low levels of control. In this regard, it could be thought of as a post-normal approach to bioremediation, an idea that classically educated engineers would likely be uncomfortable with. Professional engineering services are prohibitively expensive to the majority of urban residents, and contamination is widespread. There is therefore an imperative to develop a protocol for low-cost, non-proprietary methods for monitoring and remediation. In situations such as contaminated urban environments, where risk and need is high, the question is how to best move ahead despite high levels of uncertainty. Take phytoextraction, for instance. It’s a technology using plants that accumulate high levels of certain elements or compounds. Once accumulated the toxic materials are removed along with the plant from the site and disposed of in a way suitable to the toxins involved. It is a complicated, highly sight specific process, and has yielded varying results. At no point would I make the claim that it is a fool-proof method capable of remediating lead-contaminated soil in every instance. With this said, however, the technology has been useful in many cases. A google scholar search for “phytoextraction” will reveal numerous recent studies demonstrating the effectiveness of the method. Clearly it has enough potential that research funding is still being put towards it. So while it’s not a panacea, I believe it’s worth mentioning phytoextraction so that it might be considered as one among other potential tools for bioremediation. To exclude phytoextraction from the conversation simply because there is not a clear scientific consensus about its effectiveness and that it might result in people being harmed is equivalent to saying that people should not be taught how to fish because they might possibly fall in the water and drown. The citizen bioremediation movement is focusing on two primary aspects: soil testing and contaminant degradation/immobilization. The cost of soil testing makes it prohibitively expensive for the majority of people. Standard soil tests offered by cooperative extensions typically test only for soil macronutrients (NPK), lead (Pb) and occasionally other metals. Testing beyond these basic parameters is prohibitively expensive, as each contaminant, both organic and heavy metal, must be tested for individually. Such comprehensive soil testing can be carried out by engineering firms as phase II environmental assessments, typically at a fee of several thousand dollars. US EPA recommends doing extensive background research on any potential site in order to narrow the range of possible contaminants. The high cost of soil analysis not only makes it difficult to get a precise reading on the existing extent of soil contamination on a site, but also as to whether or not a particular remediation strategy is effective in reducing contaminant levels. Below is a description of several low-cost techniques that may be useful in providing some raw data in regards to contaminant levels in soils. Public Labs, a non-profit organization dedicated to the promotion of citizen-based environmental monitoring and analysis, has developed a prototype for a “DIY spectrometer”. The $40 device enables users to take crude measurements of contaminants in soils and water, obtaining a spectrographic signature of contaminants that can be compared to those taken by others and shared online. By containing an open source design, the spectrometer can be further modified, elaborated, and put back into circulation by its users. X-ray fluorescence, or XRF, is a technology that allows for nearly instantaneous on site readings of a wide range of soil contaminants. While the tool itself is quite expensive (in the range of $10,000), there may be the possibility of it becoming more affordable over time, or of it being “hacked” in a fashion similar to public lab’s DIY spectrometer. It may also be possible for a community to collectively purchase an XRF and have it be available for public use, or to arrange with an institution possessing one to use it in specific situations . In addition to the above parameters, a method would be excluded from the definition of “low intensity” if it relies upon the use of chemical oxidants. Low intensity methods rely upon the metabolic processes of naturally occurring biological organisms in order to remediate contaminated soils. Acceptable uses of machinery include using air pumps for culturing microbes in compost tea and the use of machines for turning or aerating compost piles. Due to its limited accessibility, low intensity bioremediation methods have limited applicability in treating contaminated groundwater. Adherence to the above criteria will ensure practices that are all economically, environmentally, and socially sustainable. Bioremediation methods that meet the listed criteria above are more likely to be successfully used by community-based organizations. Methods that are simple and affordable will have more broad scale applicability and replicability. In many cases, the naturally occurring organisms used can be collected from wild sources or can be purchased at relatively low costs from nurseries, mushroom spawn, or worm suppliers without any special licensing requirements. Non-invasive, in situ methods are desirable in that they are less likely to expose people to potential contaminants in the subsoil as only the top 12 inches of soil are those which the majority of people will come into contact with, either through passive recreation or through gardening activities. In keeping with the sustainability goals of low-intensity bioremediation, it is important that the use of renewable energy sources be encouraged. In community-based bioremediation, sterile lab techniques are purposely eschewed in favor of “wild cultivation” methods because non-sterile methods are more broadly applicable. The vast majority of the world’s population will never have access to sterile conditions, therefor for any method to have wide ranging impact it needs to be implemented without being reliant on sophisticated infrastructure. For instance, in a handful of worm compost there are likely billions of microorganisms representing an incredible diversity of species (many of which cannot even be lab-cultured or identified). The assumption is that out of that incredible diversity, the necessary organisms to degrade certain toxins are likely present. What may also be at play is an emergent and synergistic co-metabolic effect of this diversity that cannot otherwise be replicated. The end result may not be as efficient as if a handful of proprietary microorganisms were employed, but ultimately it is much more effective if it is made into a tool for use by the average person. A complexity-based approach to bioremediation may be less attractive to engineering firms as it has reduced profit potential, but would be of greater interest to citizen’s groups and activists on account of its decentralized nature and transferability. Microbial remediation: use of compost, composting, and “compost teas” for the accelerated degradation of organic pollutants and the immobilization of heavy metals. All of the above techniques employ microorganisms, chiefly bacteria, to degrade organic pollutants such as hydrocarbons. As an estimated 20% of soil microorganisms possess the ability to degrade hydrocarbons, microbial remediation primarily involves introducing soil bacteria if they are not already present, and providing them with moisture, oxygen, and a carbon source. Such techniques may be usable by an urban gardener to facilitate the cleanup of oil spills in soil resulting from automobile oil spills. Phytoremediation: A term used to define a wide range of techniques involving the use of plants for environmental remediation. These can range from phytoextraction (uptaking metals from soil using “hyperaccumulating” plants) to phytodegradation (the use of plants to create a microbially enhanced environment in soil). 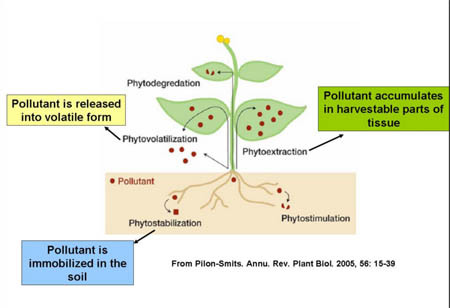 While success is dependent upon a number of complex factors, phytoextraction is one technique that has the capability to extract heavy metals from soils, which would otherwise persist indefinitely. Mycoremediation: Mycoremediation involves the use of fungi to facilitate the degradation of organic pollutants in soil. Fungi produce powerful enzymes that have been demonstrated to be capable of degrading some of the most persistent organic pollutants, including hydrocarbons, PCB’s, and dioxins. Mycoremediation can take the form of actively growing litter decomposing fungi through soil, or by spreading spent mushroom substrate over a contaminated area. Below are a few case studies of grassroots organizations that have initiated community based bioremediation programs. The Worcester Roots Project is a youth-led organization based in Worcester, Massachusetts, and was founded in 2001. Through their Toxic Soil Busters program, Worcester Roots engages in community lead safety education and remediation programs. In conjunction with the City of Worcester’s lead abatement program, the group receives contracts from the city to conduct soil sampling and remediation at residential properties. Regular tasks carried out by the group include carrying out extensive soil testing, with lead being the primary contaminant of concern. Upon receiving tests results, the group develops a plan of action based upon the revealed lead levels. For soils containing relatively low levels of lead contamination, typical remediation strategies include the addition of compost to soils in order to dilute contaminant levels and to reduce lead bioavailability through binding with organic matter. For sites with elevated lead levels where residents are wishing to garden, the group will assist in the construction of raised garden beds, lined with landscaping fabric. The fabric prevents plant roots from being able to access contaminated soil beneath, but still allows water to move through the garden bed. Ground covers, consisting of materials such as woodchips or gravel, are put down in between garden beds so as to prevent people from coming into contact with contaminated soils. In some instances where high levels of lead were found in the soil, Worcester Roots has employed phytoextraction technology in order to reduce levels to safe ranges. Plants that the group have used for phytoextraction include geraniums, indian mustards, and corn. The group made the deliberate choice not to use chemical agents in order to facilitate phytoextraction, fearing that their use would mobilize toxic metals and result in them leaching into groundwater. Phytoextraction, the group admits, is a long-term remediation strategy, and is not used in all instances because most residents want to begin gardening immediately. In its past, Worcester Roots has recommended that some soils with extremely high lead levels simply be excavated and disposed of, believing that remediation efforts would be unwarranted. The Worcester Roots Project is an excellent example of a community based organization making use of low-intensity bioremediation techniques for the purpose of cleaning up contaminated soils in their city. Their organizational structure empowers its youth members with leadership and business skills, and provides them employment and training. To research and evaluate the use of mushroom mycelium for bioremediation in an oil contaminated area of the Ecuadorian Amazon. To document and describe fungal, microbial, and botanical taxa within a petroleum pollution gradient. To identify the most appropriate substrate for growing saprotrophic fungi in the region (e.g., agricultural byproducts, debris fields, renewable resources). To evaluate plant performance as a metric for determining bioamendment-mediated decreases in soil toxicity. To provide local leaders with the materials, mentors, and skill sets to implement ‘low-tech’ mycoremediation technologies in their communities. To promote the integration of mycoremediation techniques into the skill set of methods used to clean up oil spills in the Ecuadorian Amazon. Working in rural settings without access to laboratory equipment has encouraged the group to develop innovative low-tech methods of performing soil analysis. One method was performing plant bioassays. Initially, a mixture of contaminated and non-contaminated soil was produced that would reduce plant germination rates by 50%. This method was then used to determine whether the remediation techniques employed were sufficiently degrading hydrocarbons so as to increase germination rates. AMP is working to establish a library of petroleum-tolerant fungal species that can be grown in the region. Working in the Amazon has posed its own unique challenges. The group’s installations have, on several occasions, been tampered with by both termites and oil company employees. As much of the contaminated land is owned by oil companies, it has been difficult to gain legal access on to the most contaminated areas where testing needs to be carried out. CE-RASE (the Center for Environmental Resources and Sustainable Ecosystems) is a non-governmental organization active in the Niger Delta of the West African coast. They seek means of providing environmental services to the communities living there that translate to grassroots actions. CE-RASE is a proponent of the concept of “sustainable bioremediation”, described as “the promotion of integrated environmental conservation and rural development led by community participation. The aim of CE-RASE is to empower the people “through participatory development for environmental protection using biological methods.” By doing so, CE-RASE hopes to involve rural populations in efforts to protect their lands while also providing them with economic opportunities, thereby reducing instances of civil unrest on account of frustration related to environmental degradation. Being a major center of oil production and refinement, the lands and communities in the Niger Delta are severely impacted by events such as oil spills and leakages. The impacts of the oil industry on the health of local ecosystem are severe, and frequently result in the evacuation and displacement of peoples. CE-RASE has developed techniques using kenaf, a locally grown plant, as an oil absorbent. Dehydrated and pressed into flat sheets, the kenaf mats are then pressed onto oil spills. Oil soaked mats are then transported elsewhere for microbial degradation. By training local residents in the techniques for running kenaf nurseries, CE-RASE has devised a means for people to earn income while simultaneously empowering them with the knowledge for cleaning up contamination affecting their communities and lands. Such methods employing human, plant, and microbial agency are prime examples of generative justice. The generative justice approach to citizen bioremediation greatly increases the capacity of a local community to address the persistent pollutants found in its soils in a manner that lessens their dependence on high-cost industrial approaches. Over time, and through greater sharing of techniques and information, citizen bioremediation could play a significant role in promoting the agendas of both the environmental justice and urban agriculture communities. Through forming mutually beneficial partnerships between humans, plants, fungi, and microbes in the process of bioremediation, the critical interdependencies necessary for socio-ecological health can be re-established. It is my intention that this article can help in provoking a broader conversation about the challenges, strategies, and opportunities for achieving this.